While many might think that growing grapes and running a winery sounds like a perfect way to live, the fact is that these are businesses that require good information to make decisions about production practices, labor, marketing, and more. The Finger Lakes Grape Program works with experts from Cornell, Penn State, and the private and non-profit sectors to bring this kind of information to growers. Changes made to the Agricultural Worker Protection Standard in 2015 are in effect starting January 2, 2017. This page contains resources for understanding the new rules and links to materials that can be used in training workers and handlers. The 2016 Finger Lakes Grape Price List is available for download. We received prices from fourteen buyers, and we thank them for submitting their prices to us. Keep in mind that the average price listed for each category and variety is NOT a weighted average based on tons purchased, but merely the average of the stated prices. Average prices that are lower than 2015 are shaded in red, prices that are flat (plus or minus 0.5%) are shaded in yellow, and those that are higher than last year are shaded in green. If you have any questions about the Price List, please don't hesitate to contact our office. The 2015 Finger Lakes Grape Price List is available for download below. We received prices from thirteen buyers, and we thank them for submitting their prices to us. Keep in mind that the average price listed for each category and variety is NOT a weighted average based on tons purchased, but merely the average of the stated prices. Average prices that are lower than 2014 are shaded in red, prices that are flat (plus or minus 0.5%) are shaded in yellow, and those that are higher than last year are shaded in green. The 2014 Finger Lakes Grape Price List is available for download below. We received prices from fifteen buyers, and we thank them for submitting their prices to us. Keep in mind that the average price listed for each category and variety is NOT a weighted average based on tons purchased, but merely the average of the stated prices. Average prices that are lower than 2013 are shaded in red, prices that are flat (plus or minus 0.5%) are shaded in yellow, and those that are higher than last year are shaded in green. The FLGP's annual listing of grape prices from Finger Lakes wineries and processors is available. This year, we received prices from seventeen buyers, and we thank them for submitting their prices to us. Keep in mind that the average price listed for each category and variety is NOT a weighted average based on tons purchased, but merely the average of the stated prices. Average prices that are lower than 2012 are indicated in red, prices that are flat or higher than 2012 are shown in green. Grape prices in the Finger Lakes were more encouraging in 2012 than they have been for the past several years. After a consistent pattern of flat or falling prices for most varieties since 2008, average prices for almost all varieties either held steady or increased compared to 2011. Grape prices in the Finger Lakes in 2011 continued a frustrating pattern for growers, with prices for the majority of the varieties reported remaining flat or pushing downward. While it is possible that this was partially in response to anticipation of a larger than normal crop, the trend seems puzzling especially when you consider that the "word on the street" as we approached harvest was that some buyers were having difficulty finding enough fruit for certain varieties. This year marks, for the first time in nearly a decade, the possibility of substantial concord plantings in the Lake Erie region. While acreage of concord has been remarkably stable over the past thirty years, that stability requires a certain amount of new plantings as a small percentage of acreage continually falls out of production and is either abandoned, repurposed or developed. 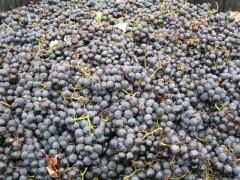 In recent years there has been an increase in the quantity demand for Concord grape. While this is certainly part of a market cycle and prices will inevitably fall and rise again, it represents a period when some growers have the capital and interest in expanding their holdings. Fuel represents a significant cost for everyone, farmers included. We have a number of generations that experienced an economy where the cost of energy could not be a consideration. It was just plain cheap. Bulk juice and wine producers spend significantly more on fuel now. The perception is that fuel costs drive up the costs of other goods, cause inflation and decrease competitiveness. I would argue that everyone has to deal with fuel prices, it decreases the supply of available money, and only impacts the costs of goods directly related to energy. The wine grape market remains more nuanced than good for growers bad for wineries or vise versa. The balance of wine grape demand and supply remains variety specific. In the last two years local wineries and buyers have worked through the oversupply of varieties much faster than anticipated. Looking at all available information, there are only a few specific examples of demand outweighing supply in any significant way. Currently the outlook for native varieties looks positive. With such strong demand for Concord, other options have held up well considering Constellation's recent exit from the Catawba market. Through its Business Programs, USDA Rural Development provides for business credit needs in under-served rural areas, often in partnership with private-sector lenders. New York State recently passed the Wage Theft Prevention Act. This law is similar to new requirements in Massachusetts, and Illinois. In the past record keeping requirements were similar to Pennsylvania. Employers have to document standard payroll data such as hourly rate, hours worked, and ensure piece rate employees were making at least minimum wage. Corporations, LLC, S-Corps and other business organizations have their place. In the excitement of limiting liability and developing into a sophisticated operation many growers look to these organizations. For some growers these organizations are absolutely essential and a bargain value. For small growers the tools offered are not always appropriate and the costs are disproportionate. Sole proprietorships and partnerships offer no liability protection, no flexibility in tax structure and other similar limitations. However, these organizations lower costs for insurance, filing fees, accounting services, and legal fees. Participation in crop insurance is an essential element of risk management for bulk production. Growers with significant leverage, or debt, are often required to purchase crop insurance. In addition to debt, practices, site and market can all impact importance of crop insurance to an individual grower.